This manifesto about the economic value of nature’s services to humans and the Earth is sure to provoke much thought and discussion. Tony Juniper likes to ask provocative questions about the world we inhabit. A prominent environmentalist, he authored the book How Many Light Bulbs Does It Take to Change a Planet? (Quercus, 2008). His current work, What Has Nature Ever Done for Us? How Money Really Does Grow on Trees, presents an even more intriguing question— and it is likely no one can answer it quite like Juniper. This wide-ranging study considers such aspects of nature as the essential components of dirt, the importance of light to living things, the enormous impact of both plant and animal pollinators, the precious qualities of water, and the remarkably rich harvest provided by Earth’s oceans. What Juniper does, however, is continuously tie nature’s “services” back to their economic value. He also shares unique information that could have a significant impact on the health of humans; for example: “The venom of a Central American bark scorpion is being studied for the role it might play in improving the success of heart bypass operations.” It is Juniper’s command of remarkable facts and ability to dramatize economic implications that turn what could have been a basic study of nature and the world’s environment into extraordinarily interesting reading. In the end, what Juniper hopes to accomplish with this finely written work is to make the public aware that nature has a “vital economic value” that cannot be taken for granted. 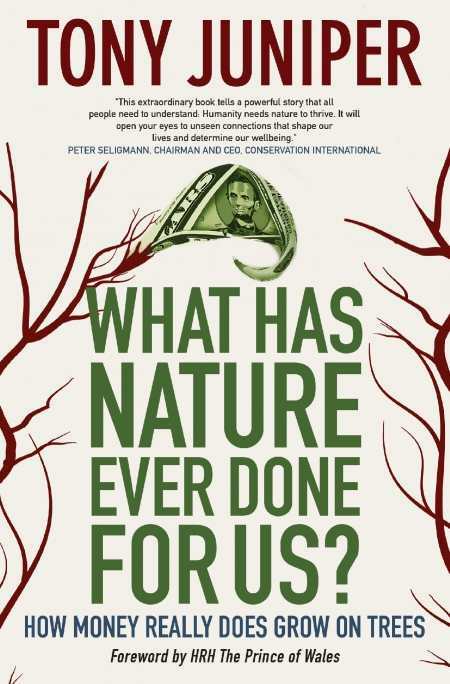 The author eloquently answers the question the book’s title poses, presenting an impassioned case for humankind to develop a much better relationship with nature. This is a book that deserves the most serious consideration by all readers.